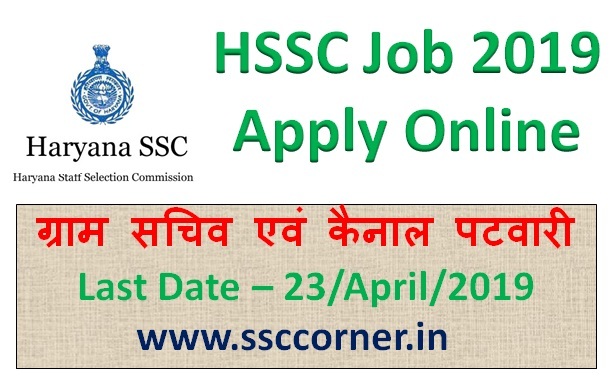 To know About More Important Dates & Eligibility Criteria of HSSC Gram Sachiv , Canal Patwari Recruitment 2019. read the full article below. Before applying online, Read Eligibility Criteria Terms and Conditions and match With official notification. Haryana Staff Selection Commission (HSSC) द्वारा ग्राम सचिव एवं कैनाल पटवारी के विभिन पदों पर भर्ती के लिए अधिसूचना जारी की गयी है .इच्छुक उमीदवार 23-04-2019 तक ऑनलाइन आवेदन कर सकते है . उमीदवार ऑनलाइन आवेदन करने से पहले योग्यता सम्बंधित नियम व शर्ते भली भांति पढ़ ले तथा अधिकारिक अधिसूचना से मिलान कर ले . HSSC Canal Patwari , Gram Sachiv Recruitment 2019 . 10th /12th pass from recognized state board / central board / University Pass or Equivalent Qualification). हायर क्वालिफिकेशन को वरीयता दी जाएगी. Canal Patwari : आयु सीमा -23/04/2019. को कम से कम 17 वर्ष व अधिकतम 42 वर्ष. Gram Sachiv : आयु सीमा -23/04/2019. को कम से कम 18 वर्ष व अधिकतम 42 वर्ष. आवेदन प्रक्रिया शुरू होने की तिथि : 21 March 2019. आवेदन करने की अंतिम तिथि : 23 April 2019. आवेदन शुल्क जमा करने के अंतिम तिथि : 23 April 2019. योग्य उम्मीदवार 23 April 2019 तक Haryana Staff Selection Commission (HSSC) की आधिकारिक वेबसाइट http://www.hssc.gov.in पर logIn करके ऑनलाइन आवेदन कर सकते है . HSSC Gram Sachiv , Canel Patwari Exam Syllabus - Click Here. HSSC Canel Patwari , Gram Sachiv Previous Year Paper - Click Here.